Royal Malaysia Police is commonly and officially known as the Polis Diraja Malaysia (PDRM). Polis Diraja Malaysia (PDRM) is headquartered in Bukit Aman, Kuala Lumpur. It is an agency under the Ministry of Home Affairs. In 1807, the Royal Charter Of Justice (Malay: Piagam Keadilan Diraja ) authorised the establishment of the Court of Judicature in Penang, then known as the Prince of Wales' Island, to exercise jurisdiction matters under a better legal system. As a result, the establishment of a modern police institution in Malaysia was started on March 25, 1807 in Penang under the Charter. 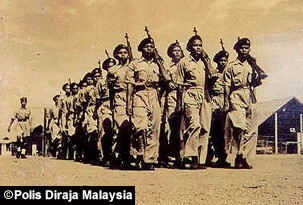 Under the British administration, the police force was known as Malayan Union Police (Malay: Polis Malayan Union). The surrender of Japan in August 1945, was followed by the establishment of the British Military Administration (BMA) to administer the Malaya territory. Consequently the Civil Affairs Police (CAPF) was formed to carry out police duties under a central police organisation, instead of each state having its own independent police forces. Civil Affairs Police of Malay Penunsula was renamed Malayan Union Police Force (Malay: Pasukan Polis Malayan Union) on April 1, 1946. When the Federation of Malaya was formed in 1948, it was renamed Malayan Federation Police Force (Malay: Polis Persekutuan Tanah Melayu). On July 24, 1958, the first Yang di-Pertuan Agong of Malaysia bestowed the title "Royal" or "Diraja" to the Malayan Federation Police Force. When Malaysia was formed on September 16, 1963, it was finally renamed Royal Police Malaysia (Malay: Polis Diraja Malaysia (PDRM)). The constitution, control, appointment, employment, police funds, duties and powers, discipline of police officers are specified and government by the Police Act 1967 [Act 344]. Polis Diraja Malaysia (PDRM) carries out its duties and responsibilities with the assistance of support group of Extra Police Constables, Police Volunteer Reserve, Auxiliary Police, Police Cadet Corps and a civilian service element. Interactive Traffic Information: Warrant Notice, Summons Notice, Postal Summons, frequent road accident locations, traffic jams, road closures, types of traffic summons and compound rates, Balik Kampung Form. 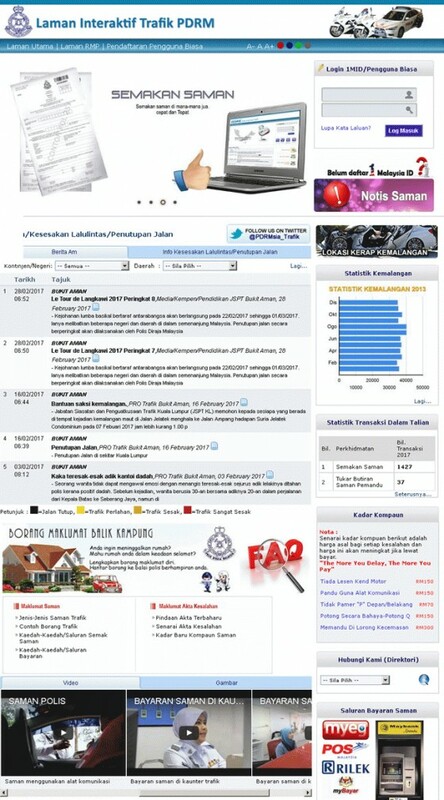 Notes: Official website available in Malay version only.